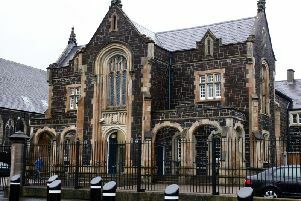 Judgment was reserved on Thursday by a senior judge presiding over the non-jury trial into the murder of Carrickfergus loyalist Geordie Gilmore. Mr Justice McAlinden said he wanted time to give “careful consideration” to all the evidence presented in the trial, and revealed he will give his judgement in due course. Mr Gilmore (44) died from a catastrophic brain injury after his Vauxhall Insignia was targeted in a gun attack in the Woodburn area of the Co Antrim town on Monday, March 13, 2017. Three men were charged with murdering Mr Gilmore and attempting to murder his two passengers. The trio - who all denied the charges - are David ‘Dee Dee’ McMaw (30) from Starbog Road in Larne, his brother Darren McMaw (33) from Kilgreel Road in Carrick and 36-year old Brian ‘Scotch Brian’ McLean, from Valetta Park in Newtownards. The trial at Belfast Crown Court commenced at the end of November 2019 and came to a close on Thursday, with Mr Justice McAlinden reserving judgement. As both the Crown and defence aired their closing submissions, the judge was urged to convict the trio by the crown, but asked to acquit all three accused by their defence teams. During the trial, several witnesses - including Mr Gilmore’s son, and a man who was in the car with Mr Gilmore when the vehicle was raked with gunfire, were called to give evidence. The court heard the fatal gun attack occurred against a background of incidents between two groups of people, and that at the time police attributed this trouble to a UDA feud. In the hours before his murder, Mr Gilmore, his son and several other men had driven from Carrick to Belfast to support a friend who was arrested following a serious assault on the doorman of a local bar. When they returned to Carrick, the Gilmore party stopped at a bakery in the town centre before travelling to the Woodlands estate, where his car was shot at. It is the crown’s case that the gunman who fired at the Insignia was David McMaw while McClean acted as a look-out, and that Darren McMaw involved himself in a “scouting exercise” by following Mr Gilmore in his van prior to the fatal gun attack. All three defendants declined to give evidence during the trial, and have denied all the offences against them. Crown barrister Liam McCollum QC told Mr Justice McAlinden that as he had now heard all the evidence, he should be satisfied of the three men’s guilt. Pointing out that witnesses identified David McMaw as the gunman who fired from an alleyway, the prosecutor reminded the judge “there was a murder, there was a gunman, there were six shots fired”. Mr McCollum also told Mr Justice McCollum that all three defendants declined to challenge the evidence given by these witnesses, adding “it should not be too difficult” for David McMaw and McClean “to tell the court where they were, if it was not them identified at the scene of the murder.” Regarding Darren McMaw, Mr McCollum said “it would not have been difficult to explain the movements of his van”. Barristers for each of the defendants argued in their closing submissions that the Crown had failed to prove, beyond reasonable doubt, the guilt of their clients. Eilis McDermott QC, representing David McMaw, questioned whether the evidence proved her client was the gunman. Ms McDemott noted a video which was played during the trial of a 100-strong crowd gathered outside the Gilmore home in July 2016, and said this indicated there were “an unknown number of people who may have been prepared to kill George Gilmore”. Citing the identification of David McMaw as “poor,” Ms McDermott spoke of “collusion” between the witnesses who she said were “part of a cohesive group” who had a “purpose of their own to serve”. Brendan Kelly QC said his client, McClean, was also identified at the scene by the same “unreliable” witnesses. Telling Mr Justice McAlinden that no evidence was presented which indicated McClean’s role in a joint enterprise, or that he was waiting at the scene for the Gilmore party, the barrister described evidence against McClean as “thin on the ground”. Darren McMaw’s barrister, Gavan Duffy QC, spoke of an “evidential vacuum” against his client, and said the case against him relied on the crown’s assertion that there was a “pre-formed plan for murder or really serious harm to be meted out to the deceased, and that Mr McMaw was involved”. Mr Duffy raised concerns about the Crown’s case, spoke of a “series of imponderables”, and spoke of a lack of evidence to suggest his client offered assistance both before and after the murder. Following the hearing, Mr Justice McAlinden said: “In the absence of any other submissions, this brings to a close the trial of these three defendants. The Judge concluded the trial by saying he will give a “detailed written judgment” in due course.